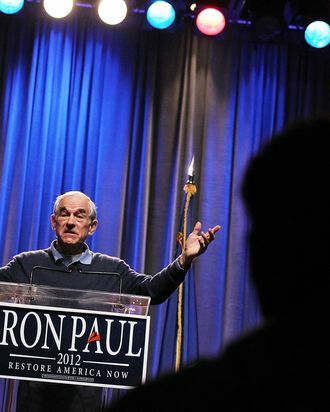 Republican presidential candidate, U.S. Rep. Ron Paul (R-TX) speaks during a campaign rally at the Grand Sierra Hotel on February 2, 2012 in Reno, Nevada. Paul is campaigning ahead of Nevada's caucus on February 4. According to the rules of the RNC, any candidate who wins a plurality of delegates in five or more states will be placed on the ballot at the convention, and will be given a fifteen-minute speaking slot. Ron Paul has won the plurality in four states. On Saturday, Nebraska is holding the country’s final state convention. Come on Nebraska, we want to see that speech.